A survey of the extracellular ATP levels of 86 heterotrophic bacteria showed that gram-negative bacteria of the genera Sulfitobacter, Staleya, and Marinobacter secreted elevated amounts of extracellular ATP, ranging from 6.0 to 9.8 pM ATP/colony forming unit (cfu), and that gram-positive bacteria of the genera Kocuria and Planococcus secreted up to 4.1 pM ATP/cfu. Variations in the levels of extracellular and intracellular ATP-dependent luminescence were monitored in living cells of Sulfitobacter mediterraneus ATCC 700856T and Planococcus maritimus F 90 during 48 h of attachment on hydrophobic (poly[tert-butyl methacrylate], PtBMA) and hydrophilic (mica) surfaces. The bacteria responded to different polymeric surfaces by producing either intracellular or extracellular ATP. The level of intracellular ATP in S. mediterraneus ATCC 700856T attached to either surface was as high as 50-55 pM ATP/cfu, while in P. maritimus F 90 it was 120 and 250 pM ATP/cfu on PtBMA and mica, respectively. S. mediterraneus ATCC 700856T generated about 20 and 50 pM of extracellular ATP/cfu on PtBMA and mica, respectively, while the amount generated by P. maritimus F 90 was about the same for both surfaces, 6 pM ATP/cfu. The levels of extracellular ATP generated by S. mediterraneus during attachment on PtBMA and mica were two to five times higher than those detected during the initial screening. High-resolution atomic force microscopy imaging revealed a potentially interesting correlation between the porous cell-surface of certain a- and g-proteobacteria and their ability to secrete high amounts of ATP. [Int Microbiol 2006; 9(1):37-46]. Un estudio de los niveles del ATP extracelular de 86 bacterias heterotrofas mostró que las bacterias gram-negativas de los géneros Sulfitobacter, Staleya y Marinobacter secretaron grandes cantidades de ATP extracelular 6,0 a 9,8 pM ATP/unidad formadora de colonia (cfu) y las bacterias gram-positivas de los géneros Kocuria y Planococcus secretaban cantidades de hasta 4,1 pM ATP/cfu. Las variaciones de los niveles extracelulares e intracelulares de luminiscencia dependiente de ATP fueron controlados en células vivas de Sulfitobacter mediterraneus ATCC 700856T y Planococcus maritimus F 90 durante 48 h de adherencia a superficies hidrofóbicas (poli[tert-butil metacrilato], PtBMA) e hidrofílicas (mica). Las bacterias respondieron a las diferentes superficies produciendo ATP intracelular o extracelular. El nivel de ATP intracelular en S. mediterraneus ATCC 700856T llegó hasta 50-55 pM ATP/cfu en ambas superficies, mientras que para P. maritimus F 90 fue de 120 pM ATP/cfu en PtBMA y de 250 pM ATP/cfu en mica. El ATP extracelular generado por las células de S. mediterraneus ATCC 700856T se situó entre 20 pM ATP/cfu en PtBMA y 50 pM ATP/cfu en mica, mientras que para P. maritimus F 90 era casi igual en ambas superficies, 6 pM ATP/cfu. Los niveles detectados de ATP extracelular generados por S. mediterraneus durante la adherencia a PtBMA y a mica fueron de 2 a 5 veces los detectados en el cribado inicial. Las imágenes obtenidas mediante microscopia de fuerza atómica de alta resolución pusieron de manifiesto una correlación de posible interés entre la superficie celular porosa de ciertas a- y g-proteobacterias y la capacidad de secretar grandes cantidades de ATP. [Int Microbiol 2006; 9(1):37-46]. O exame dos níveis do ATP extracelular de 86 bactérias heterotróficas mostrou que as bactérias gram-negativas dos gêneros Sulfitobacter, Staleya e Marinobacter secretaram quantidades elevadas de ATP extracelular dentre 6,0 a 9,8 pM ATP/unidade formadora de colônia (cfu), e que as bactérias gram-positivas dos gêneros Kocuria e Planococcus secretaram quantidades de até 4,1 pM ATP/cfu. As variações dos níveis extracelular e intracelular de luminescência ATP-dependente foram controlados em células vivas de Sulfitobacter mediterraneus ATCC 700856T, e Planococcus maritimus F 90 durante 48 h de aderência a superfícies hidrofóbicas (poli[tert-butil metacrilato], PtBMA) e hidrofílicas (mica). As bactérias responderam às diferentes superfícies produzindo ATP intra ou extracelular. O nível de ATP intracelular em S. mediterraneus ATCC 700856T chegou a 50-55 pm ATP/cfu nas duas superfícies, enquanto em P. maritimus F 90 foi 120 e 250 pM ATP/cfu em PtBMA e mica, respectivamente. O ATP extracelular gerado pelas células de S. mediterraneus ATCC 700856T situou-se entre 20 e 50 pM ATP/cfu em PtBMA e mica, respectivamente, enquanto o P. maritimus F 90 foi quase igual que nas duas superfícies, isto é, 6 pM ATP/cfu. Os níveis de ATP extracelular gerados por S. mediterraneus durante a aderência a PtBMA e a mica foram de 2 a 5 vezes mais elevados do que os detectados durante a sondagem inicial. A projeção de imagem atômica de alta resolução revelou uma correlação potencialmente interessante entre a superfície celular porosa de certas a- e g-proteobactérias e a sua capacidade para secretar quantidades elevadas de ATP. [Int Microbiol 2006; 9(1):37-46]. Adenosine triphosphate (ATP) is a universal energy carrier in biological systems and contributes to biochemical reactions, active transport, nucleic-acid synthesis, muscle activity, and the movements of cells [10,32,39]. A rise in the cytosolic ATP concentration is a key event in the functioning and membrane depolarization of ATP-dependent K+ channels (KATP channels) [8,11,36,49]. Accordingly, measurement of cellular ATP levels in living cells is crucial for assessing their metabolic state. Measurement is also important as the functions of extracellular ATP are diverse and include physiological involvement both in normal cellular functions and in pathological conditions: for instance, ATP plays a role in the regulation of Ca2+ and iodide fluxes and the generation of H2O2 [33,41]. Extracellular ATP also has an effect on the mammalian heart, on blood pressure, and it acts as a neurotransmitter [10,41]. In most organisms, either protons or sodium ions facilitate ATP synthesis by translocating F1F0-ATP synthases. These enzymes consist of two parts, a membrane-intrinsic F0 subunit and a membrane-extrinsicF1 subunit. When detached from the membrane,F1 functions exclusively as an ATP hydrolase [11,13,22,36,38]. ATP synthases are involved in the synthesis of ATP from ADP and Pi by oxidative phosphorylation, both in aerobic bacteria and in the mitochondria of eukaryotic cells [22,26]. ATP synthases are also involved in the synthesis of ATP from ADP and Pi by photosynthetic phosphorylation in the chloroplasts of plant cells utilizing the transmembrane chemiosmotic energy of a proton or sodium gradient [26,38]. Except for their extended coupling-ion specificity, ATPases are closely related with respect to structure and function. The most carefully investigated bacterial F1F0 complex is that from Escherichia coli (F1F0Ec) [13,44]. It consists of eight subunits, essential for the enzyme complex [44,46], and functions through a sophisticated mechanism similar to that of a rotary motor [38,42]. Advances in nanobiotechnology and metabolic engineering have prompted intensive studies of biochemical networks and specific metabolic (including quorum signaling) pathways in bacteria [2,3,14]. One of the recent examples is a report in which an ATP synthase immobilized into the lipid membrane was used to generate ATP from ADP and inorganic phosphate; in addition, the suitability of ATP generated for use in coupled enzymatic reactions was evaluated [6,51]. While the complexity of bioengineered designs has resulted in a lack of system robustness, cells represent a unique integrative system capable of effectively responding to environmental disturbances. A better understanding of bacterial physiology and their adaptive cellular mechanisms would enable a more effective identification of metabolic engineering strategies for biotechnological applications [6,48]. The presence of microorganisms on material surfaces can have a profound effect on material performance and on the metabolism of the attached cells [4,50]. In this context, our study aimed to investigate the effect of hydrophobic poly(tert-butyl methacrylate), (PtBMA) and hydrophilic (mica) surfaces on the extra- and intracellular ATP levels of two heterotrophic bacteria growing on them: Sulfitobacter mediterraneus ATCC 700856T and Planococcus maritimus F 90. These two strains, amongst a few others that generate high amounts of extracellular ATP, were selected after screening of several phylotypes of the domain Bacteria, comprising 86 strains of 17 genera. The ATP levels were examined in cell extracts and in the culture liquid using an ATP-dependent luminescent protein luciferase assay [15,32] during 48 h of bacterial attachment and biofilm formation. Simultaneously, various operating modes of atomic force microscopy (AFM), including friction force mode, were employed to investigate whether there were differences in the surface ultrastructures of the bacteria that produced different amounts of extracellular ATP. Bacterial strains. Table 1 shows the type strains and environmental (marine) bacterial isolates belonging to the 17 genera used in this study. Type strains were obtained from the American Type Culture Collection (ATCC, Rockville, MD, USA), the Culture Collection of Pasteur Institute (CIP, Paris, France), the German Collection of Microorganisms (DSM, Braunschweig, Germany), the Institute of Molecular and Cellular Biosciences (IAM, Tokyo, Japan), and the National Collection of Industrial and Marine Bacteria (NCIMB, UK). Other strains were from the Collection of Marine Microorganisms (KMM Vladivostok, Russia), and kindly provided by U. Simidu (University of Tokyo, Japan), M. Akagawa-Matsushita (University of Occupational and Environmental Health, Kitakyushu, Japan), P. Hirsch (Institut für Allgemeine Mikrobiologie, Christian-Albrechts-Universität, Kiel, Germany), J. Guinea, T. Sawabe (Hokkaido University Hakodate, Japan), A. Sánchez-Amat (University of Murcia, Spain), and C. Holmstrom (The University of New South Wales, Sydney, Australia). Strains used in this study were routinely cultured on Marine Agar 2216 (Difco, USA) and PYGV agar plates  and stored at -80°C in marine broth 2216 (Difco) supplemented with 20% (v/v) of glycerol. Polymeric surface preparation. Poly(tert-butyl methacrylate) (Sigma-Aldrich, St. Louis, MO, USA) and mica (Ted Pella, Redding, CA, USA) were used as surfaces. The surfaces were prepared as described elsewhere . Briefly, PtBMA (47 kDa, molecular weight/polydispersity, Mw/Mn = 2.33) dissolved in cyclohexanone (99.9%) (Sigma-Aldrich) was spin-coated (substrates: #1 glass cover slips, 10-mm diameter), after previously being primed with hexamethyldisilasane (HMDS, Sigma-Aldrich). The substrates were sonicated in PriOH for 30 min, washed with copious amounts of filtered (0.2 mm) Nanopure water, and dried under a stream of high-purity nitrogen. The polymeric films were spin-coated on primed glass substrates by using tetrahydrofuran (THF) solution at concentrations of 2-5 mg/ml. The primer was spun at 1000 rpm and polymers at 3000 rpm with a ramp acceleration of 1000 rpm using a spin coater (Model P6708, Specialty Coating Systems, Indianapolis, IN, USA). Finally, polymeric slides were baked at 95ºC for 60 min. Muscovite mica sheets were freshly cleaved and used as received. Contact angle measurements. Advancing contact angles were measured on sessile drops (2 ml) of Nanopure water at room temperature (20-23ºC) in air, using a contact-angle meter constructed from an XY stage fitted with a (20 ml) microsyringe, a 20× magnification microscope (Isco-Optic, Göttingen, Germany), and a fiber-optic illuminator. The images were captured using a digital camera (Aiptek, Tokyo, Japan) and analyzed using PaintShop Pro (Jasc Software). Observed values were averaged over six different readings. We defined the PtBMA polymeric surface as being hydrophobic with a measured water contact angle of 91º and mica as being hydrophilic with a much smaller contact angle of 5º. Bacterial growth and sample preparation. For initial screening, bacterial suspensions of freshly grown cells (1.0-2.0 × 108 cells/ml, optical density, OD660 = 0.13-0.2) were used for inoculation of 0.5 l of Marine Broth 2216 (Difco). Bacteria were cultured for 18-24 h at room temperature (ca. 22-24°C) without any growth-limiting factors and were harvested at the late exponential phase of growth. The growth phases were monitored spectrophotometrically. Bacterial strains were grown on Marine Agar 2216 plates at 28°C for 48 h. Polymeric slides and freshly cleaved mica disks were placed in sterilized Nunc multidishes (12 wells). The polymer-lined wells were inoculated with exponential-phase cultures (3 ml). The cells were plated in duplicate for each polymeric surface and the experiment was repeated 12 times to monitor cell growth and ATP generation every 4 h over the course of the experiment. Cell density was adjusted to OD660 = 0.13 ± 0.05 by the addition of phosphate-buffered saline (PBS) containing 50 mM phosphate and 150 mM NaCl (pH 7.4). A 300-µl cell aliquot was added into 2700 µl of Marine Broth 2216. The same suspension of each strain (3 ml, in triplicate) was added to an empty well and served as a control. Every 4 h, a correspondent aliquot (10 µl, in triplicate) of bacterial suspension was removed and the amount of extracellular ATP was measured. The optical density of bacterial cells in the wells was also monitored. The biofilms formed on the polymeric surfaces by statically grown bacteria were rinsed three times with PBS, and the attached cells were carefully scraped off and resuspended in 1 ml of PBS to determine the level of intracellular ATP. Bioluminescence assay for ATP determination. Bioluminescence was monitored with a fluorimeter (FluorStar Galaxy, Offenburg, Germany) in white opaque 96-well microtiter plates (Nunc, Copenhagen, Denmark). The internal cellular ATP concentration and the external ATP concentration in the medium were analyzed separately. ATP generation was detected using the Enliten ATP Detection Kit (Promega). The homogeneous assay procedure involves adding a single reagent directly to bacterial cells cultured in medium and measuring ATP as an indicator of metabolically active cells. The procedure was carried out according to the manufacturer's protocol. Each well contained 10 µl of the bacterial suspension sample. Bioluminescence was recorded after the automatic injection of 90 µl rLuciferase/ Luciferin (rL/L) reagent. Light measurements were made in triplicate for each sample and for the negative control. ATP values are given as relative units, which define the amount of light emitted per unit of cell density. The levels of extracellular ATP were measured directly in bacterial suspension, and the levels of intracellular ATP in samples prepared via extraction of ATP by 1% trichloroacetic acid (TCA, Sigma-Aldrich). 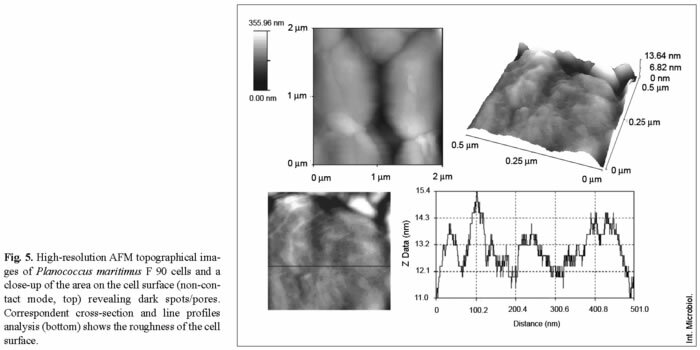 Cell-surface characterization by atomic force microscopy (AFM). AFM characterization of the cell surfaces was carried out on a TopoMetrix Explorer (model no. 4400-11, Sebastopol, CA, USA) in both the non-contact and normal contact modes using 2-µm and 100-µm scanners. The analyses were done under air-ambient conditions (23°C, 45% relative humidity). Pyramidal silicon-nitride tips attached to cantilevers with a spring constant of 0.032 N/m were used in the contact mode, whereas silicon tips and cantilevers with a spring constant of 42 N/m and a resonant frequency of 320 kHz were used in the non-contact mode. The scanning direction was perpendicular to the axis of the cantilever and the scanning rate was typically 4 Hz. Levels of ATP detected in heterotrophic bacteria of different taxa. An estimate of the levels of ATP generated by 85 microorganisms of the 17 genera analyzed revealed that most of the frequently detected bacteria that secreted elevated amounts of ATP were members of the a-proteobacteria (e.g., Sulfitobacter spp. and related bacteria) and some g-proteobacteria (in particular Marinobacter spp. ), whereas members of certain gram-positive taxa, e.g., Kocuria spp. and Planococcus spp., secreted lesser amounts of ATP. In general, there were significant variations in the levels of secreted ATP, ranging from 190 µM ATP or 0.1 pM ATP per colony forming unit (cfu), as detected in Pseudoalteromonas spp., to 1.2-1.9 mM ATP or 6.0-9.8 pM ATP/cfu, as detected in Sulfitobacter spp., Staleya guttiformis, and Marinobacter spp. (Table 2). From the screening, two distantly related strains, gram-negative Sulfitobacter mediterraneus and gram-positive Planococcus maritimus, were selected in order to investigate the impact-if any-of surface hydrophobicity (in hydrophobic PtBMA and hydrophilic mica) on ATP production and secretion. The rationale of this selection was based on the notion that cellular membranes of gram-negative and gram-positive microorganisms differ significantly, and therefore it is of interest to understand whether the response of the attached cells reflects this difference. Both of the selected strains secreted the largest amounts of extracellular ATP in the culture fluid, in contrast to their counterparts of related and non-related phylotypes (Table 2). Pattern of bacterial growth on surfaces. The relative number of attached cells of S. mediterraneus increased slowly, and stabilized at 6 × 108 cfu/ml after about 32 h on the hydrophobic PtBMA surface. The number of attached cells on the hydrophilic mica remained low over the period studied (Fig. 1). In contrast, the number of attached cells of P. maritimus increased rapidly within the first 20 h, up to 1 × 108 cfu/ml on PtBMA, and continued to increase over a period of 48 h. On the mica surface, the number of attached cells of this species reached 2 × 108 cfu/ml after 24 h and it stabilized at this level for the following 24 h (Fig. 2). Notably, the growth pattern of planktonic cells of each strain in the correspondent wells with different surfaces was identical, although strain-specific features were retained all the time. Overall, it appeared that both strains showed a better propensity of attachment to hydrophobic surfaces than to hydrophilic ones. Effect of polymeric surfaces on intracellular ATP generation. The levels of intracellular ATP in both species of bacteria were higher than those of extracellular ATP (Figs. 1, 2). In addition, the levels of intracellular ATP varied during bacterial-cell attachment and biofilm formation over the 48-h experiments. For example, the level of ATP in S. mediterraneus increased significantly after 16 h of attachment on PtBMA and after 28 h on mica. Similar kinetics for intracellular ATP were observed in P. maritimus albeit over a different time frame. A sharp increase of intracellular ATP production was detected in the early exponential phase of growth, after 8 h of attachment on PtBMA, and after 28 h on mica after a prolonged exponential phase of growth (Figs. 1, 2). In general, the level of intracellular ATP correlated with the bacterial growth pattern, i.e., intracellular ATP levels reached maximum values when cells were at the exponential phase of growth, and they decreased when cells exited this phase and entered the stationary growth phase. The average reduction in the amount of intracellular ATP produced by the two strains after 44 h was 70-90%. Variation in extracellular ATP generation. The levels of intracellular ATP of attached cells were in concert with both the extracellular ATP levels and the planktonic cell density in the same wells above the surfaces. The increase in the extracellular level of ATP of S. mediterraneus followed immediately the increase in its intracellular level of ATP. By contrast, some 4 h after intracellular ATP levels increased in P. maritimus, its extracellular ATP levels increased. Similar patterns of intracellular and extracellular ATP production were observed on both surfaces. The levels and proportions of intracellular versus extracellular ATP significantly differed in the two strains (Figs. 1, 2). For example, the level of intracellular ATP in S. mediterraneus was 50-55 pM ATP/cfu on both polymeric surfaces, while P. maritimus produced more intracellular ATP. In fact, P. maritimus intracellular production was about 2.5-5 times higher and ranged from 120 to 250 pM ATP/cfu depending on the surfaces, e.g., about two-fold more on mica. The amount of extracellular ATP generated by P. maritimus planktonic cells was 6 pM ATP/cfu, and about the same for both PtBMA and mica, while the amount of extracellular ATP generated by S. mediterraneus ranged from 20 to 50 pM ATP/cfu, and was more than two-fold higher in the wells with mica (Figs. 1, 2). AFM investigation of bacterial surface ultrastructure. High-resolution AFM images of the cell surfaces at 0.5 µm (lateral dimension) of two representative strains that secreted high amounts of extracellular ATP, i.e., Staleya guttiformis and Marinobacter excellens, are shown in Figs. 3 and 4. A few individual cells were selected and typical cell surfaces were imaged at closer range. The surfaces of Staleya guttiformis and Marinobacter spp. cells appeared to be "porous", with a surface roughness of about 11 nm. Although it was rather difficult to accurately estimate the depth of these surface features because of limitations of the AFM tip [7,17-19,25], there is no doubt about the presence of porous features on the surfaces of these bacteria. High-resolution cell surface images of bacteria that did not secrete pronounced amounts of extracellular ATP (see Table 2), e.g., Planococcus maritimus and Formosa algae cells, were also obtained. In contrast to bacteria from the first group, the surface of Planococcus spp. 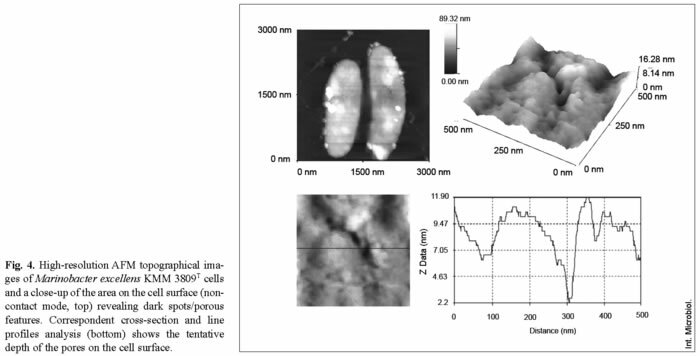 was found to be smooth with only 3 nm of cell-surface roughness (Fig. 5). 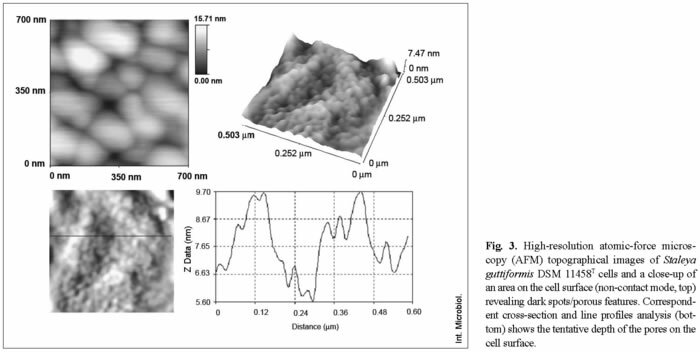 Formosa algae produces extracellular polymeric material (most probably polysaccharides), as revealed by previous AFM analysis . As its surface appeared to be of amorphous "gel-like" texture, it was not possible to obtain high-resolution images of those cells. Our survey of 86 heterotrophic bacteria showed that certain genera produced high levels of extracellular ATP. A genus-specific metabolic pattern could be also observed, even though there were some intra-species and intra-strain variations. Sulfitobacter spp., Staleya guttiformis, and Marinobacter spp. generated notable amounts of ATP (see Table 1). To our knowledge, this is the first report in which the ATP levels among diverse taxa have been estimated; therefore, no data are available that can be comprehensively compared with our experimental results. Nevertheless, our results are in agreement with previously reported data on the levels of ATP in microbial cells [8,15,21] and comparable to the amounts detected in mammalian cells . For example, Di Tomaso et al. reported that recombinant cells of phototrophic Rhodobacter capsulatus (OD660 = 0.5; 3 × 108 cells/ml) contained 1.35-2.64 mM ATP (0.6 pM ATP/cfu), and Biteau et al. found that Saccharomyces cerevisiae contained 1.78 mM ATP. Our study of the growth patterns of two bacterial strains on surfaces of different hydrophobicities and bacterial generation of intracellular and extracellular ATP revealed a few particular characteristics. Firstly, the generation of intracellular and extracellular ATP was followed by bacterial growth during attachment, which, in turn, was controlled by the type of surface. Both strains showed greater attachment to the hydrophobic PtBMA surface. This observation is in agreement with the well-known notion that most bacteria are more prone to attachment to hydrophobic than to hydrophilic surfaces. Yet, the driving mechanisms of this phenomenon remain unclear [12,21,33,37]. While the physical environment provided by the PtBMA and mica surfaces no doubt exerts an effect on P. maritimus and S. mediterraneus cells, remarkably, these bacteria responded differently, by producing increasing levels of either intracellular (P. maritimus) or extracellular (S. mediterraneus) ATP. Secondly, in both strains the levels of intracellular ATP were higher than those of extracellular ATP. This finding is not surprising. It is logical that the generation of sufficient amounts of ATP by the cells, in particular during exponential growth, is essential for metabolic intracellular processes. During the attachment of either strain on hydrophilic mica, the highest increases in ATP production occurred after a prolonged lag period, while the same increase in ATP levels on hydrophobic PtBMA occurred earlier. Such changes in intracellular ATP may indicate that the chemical and/or physical properties of the surfaces affect cellular metabolism. The increase in the ATP level might be a reflection of the activities of several intensive metabolic processes as cells adapt, and then attach to the surface. Recently, it was shown that more than 200 bacterial genes are involved in the change from planktonic to biofilm life-style [3,30,53]. Notably, the levels of intracellular ATP in the studied strains differed, in that the successful colonizer, P. maritimus, contained up to five-fold more intracellular ATP than S. mediterraneus strains. Thirdly, higher amounts of extracellular ATP were secreted by S. mediterraneus on mica, which appeared to be 'difficult' for bacterial colonization, than on PtBMA. The cell response to this 'unfriendly' physical environment might therefore have been an increase in the release of extracellular ATP. In contrast, during attachment on PtBMA, no dramatic changes in extracellular ATP levels were observed in either strain (S. mediterraneus secreted twice the amount found in our initial results). This observation can be partially explained by the fact that the bacterial densities of biofilms formed by both cultures on PtBMA polymeric surfaces did not reach the saturation level of 1012 cfu/cm3 [3,29], so that the cell-density-dependent signaling system to control the production of cellular metabolites might not have been activated yet . A biofilm-specific signaling system can induce planktonically grown cells to behave as if they were in a biofilm by regulating the expression of cellular metabolites , so that an increase in ATP production would be also expected. Lastly, the finding that Sulfitobacter spp., Staleya guttiformis, and Marinobacter spp. generated high amounts of ATP prompted further investigation into whether ATP generation and secretion might be reflected in distinct features of the cell surface. AFM imaging of the bacterial cell surface at high resolution revealed topographic peculiarities of those bacteria that secreted high amounts of extracellular ATP. These images showed "porous" features on the surface of the studied strains (dark spots on Figs. 3, 4). There is no direct evidence yet that the "porous" features found on the cell surface of Staleya guttiformis and Marinobacter excellens include ATP synthases that might facilitate ATP secretion. However, recently published research suggests that ATP synthesis is driven by a trans-membrane electrochemical gradient generated by light or oxidative reactions via the F0 part of ATP synthases incorporated into the cellular membrane [22,26,35]. High-resolution AFM and transmission cryo-electron microscopy images of the ATPase from Ilyobacter tartaricus embedded into a lipid membrane [32,47] revealed the native structure and sizing of a single ATP synthase molecule. An average outer diameter of 5.4 ± 0.3 nm and a vertical roughness of about 3 nm were reported and are consistent with the sizes of the holes visualized on the surfaces of Staleya guttiformis and Marinobacter excellens. The dimensions of the protrusions ("bumps") on the cell surface of these strains were about 20-35 nm, with a vertical roughness of 4-11 nm. These measurements correlate well with the sizes of lipopolysaccharide (LPS) bundles reported recently . While investigating the dynamics of LPS assembly on the surface of E. coli, Kotra et al. obtained high-resolution images of the bacterial surface similar to those obtained in this study. The authors suggested that the spaces among these LPS bundles might be surface water-filled protein channels . Within the outer membrane of gram-negative bacteria, particular proteins (antiporters, ABC transporters, symporters, porins, and other energy-transducing proteins) are incorporated in gated channels that facilitate entry of certain molecules into the cell [5,8,20]. This assumption does not exclude the possibility of the incorporation of ATPase into similar channels, which we observed on Staleya guttiformis and Marinobacter excellens cell surfaces. These bacteria may have an effective membrane ultrastructure that facilitates the secretion of ATP. Both a- and g-proteobacteria represent abundant groups of marine prokaryotes [9,52] that carry out several crucial ecological functions, including the reduction or oxidation of sulfur compounds [40,45], the biodegradation of hydrocarbons and other compounds [9,16, 23,24], and the development of oxidant-dependent signal transduction systems [1,43]. These are thermodynamically unfavorable processes that are coupled to both an electrochemical proton gradient and the hydrolysis of ATP. In our experiments, the attachment of the bacteria onto hydrophilic mica might have imitated somewhat similar thermodynamically unfavorable/stressful processes, with a subsequent increase in the generation of ATP. Thus, our results have yielded useful insights in understanding the impact of hydrophilic and hydrophobic surfaces on bacterial attachment and ATP generation and further modeling of bacterial metabolism. Further detailed studies of ATP synthases from Sulfitobacter, Staleya, and Marinobacter will provide information on their functional applicability in nanobiotechnology. This study was funded by Australian Research Council (ARC) and Defence Advanced Research projects Agency (DARPA) grants. The authors are thankful to David Boots and the editorial office of the journal for editing of the manuscript.